There are 10 principles of Intuitive Eating and the 10th principle is “Gentle Nutrition”. There’s a reasons it’s last; there’s a lot of healing to be done before someone is truly able to receive any sort of nutrition information without it feeling tremendously triggering. If you struggle with disordered eating, one of the worst things for you will be more nutrition advice. It’s often what you want and even feel you need, but in reality it’s being filtered through too much judgment, shame and fear. That’s OK though. You don’t need the nutrition advice to learn how to be a normal eater. In fact, not having so much outside noise will enable you to connect to that innate part of you which knows how to eat. This may seem funny coming from a dietitian and trust me, I can understand that. When I received my degree and certification over 12 years ago, I truly thought I would help people by telling them what to eat. I soon realized that most people know what to eat, lack of information is certainly not an issue and may actually create one. Sure, nutrition is a science and that’s what drew me to the profession in the first place. I love the science of nutrition and because I understand it, I know you don’t have to overthink, overanalyze or second guess. Healthy eating has so much to do with flexibility, variety, satisfaction and what’s happening over weeks or months, not meal to meal or day to day. All that said, caring less about what you eat is actually a good first step to creating something nourishing, flexible and satisfying. Essentially there is a way to care about what you’re eating without really caring at all. I’m going to give you 4 steps for how to get there. No judgment. This is a hard one but it’s really gotta happen. If you are still judging food as good or bad, then you’ll still care in ways that aren’t truly effective and helpful. Does that mean you see all food as nutritionally equal? Definitely not because that’s not the case. It means you’ll have the same emotional reaction no matter what you eat – you aren’t patting yourself on the back for eating carrots and hitting yourself over the head for eating cake. It’s just food, there isn’t any morality tied to it. The practice here is to reframe your beliefs about food to include the idea that all foods can fit. Check in and connect. I recently saw this quote: “When you have a deep level of self-awareness, you can tell if you’re getting the nutrition you need.” – Daxle Collier. I often have clients record their hunger, fullness and satisfaction levels before and after meals. The point is not to judge how often you get too full or too hungry and therefore turn this exercise into another rule. It’s also not necessary to expect yourself to do it every meal of every day, because life gets busy and sometimes food gets us from point A to point B. Instead, the objective is to CONNECT. Knowing what you’re body is communicating to you will be a key factor in learning how to care without caring. You’ll be internally motivated by innate signals rather than externally motivated by the clock or calories or rules or what everyone else is doing. The confidence you’ll build through checking in and connecting will be pivotal. Recognize that food confidence comes one meal at a time. Every meal is an opportunity to learn more about yourself. What nourishes and satisfies you, what keeps you energized and full, what isn’t enough food, what’s too much food, etc. So instead of the judgment we discussed above, curiosity will be your biggest asset. There’s a learning curve here and many people give up because they think they aren’t “getting it” when there’s not anything to get except whatever lessons food may be teaching you that day. I understand it’s easy to feel overwhelmed and discouraged, I’ve been there. But trust the process, you’re learning every day and every day gets you closer to food freedom. Nutrition therapy with a dietitian can certainly help in that process. Speaking of which, I’ve learned something new being pregnant – I really love a little bit of orange juice with my meals. It helps me feel more settled and satisfied after a meal and it’s super refreshing, especially in the first trimester when I had low grade nausea all day long. I also have a theory that it’s helping me absorb the iron in my meals (vitamin C enhances iron absorption) so the craving I have may actually be body wisdom (my iron levels are within normal ranges without taking an iron supplement). If I had a bunch of judgment or rules about drinking orange juice, I would miss out on the satisfaction and nourishment it’s providing me. Don’t focus on what others are doing, focus on what you are doing. The thing that messes us up the most is the disconnection that happens when we lose ourselves in pursuit of keeping up with everyone else. This process is deeply personal, even among those making peace with food. It’s not about being good or bad or doing it right or wrong but learning how to be true to yourself. Get rid of triggering social media feeds, leave food obsessive conversations, set boundaries and do whatever else is necessary to help you stay connected to this process and to yourself. And then, after you’ve gained more self-trust and lost the judgment, shame and fear, perhaps it’s possible to address nutrition without feeling triggered or overwhelmed. However, it may not be necessary at that point because you’ve likely learned you can naturally self-moderate without a bunch of rules. Basically, you’ll care but not care. It’s a hard frame of mind to describe but it’s only possible when you’ve fully separated what you eat from your worth and value. In this process you’ll find your value outside of food and realize what your body looks like or what you decide to eat doesn’t determine your worth. That’s important because, at the end of the day, that’s what keeps us stuck in caring too much. 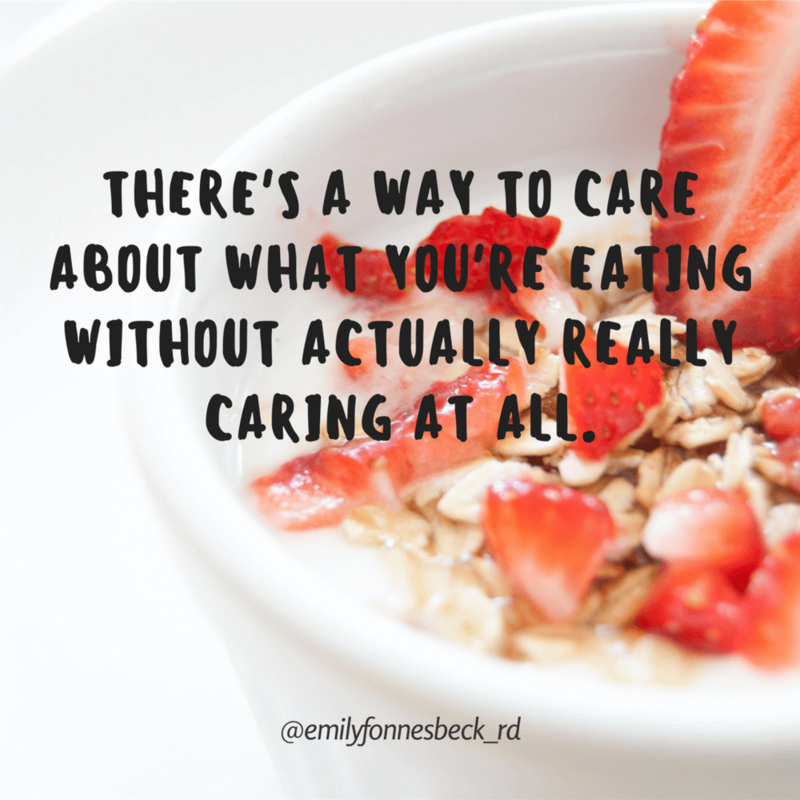 You aren’t what you eat, food doesn’t define you and it’s quite possible to care about your health and wellbeing without caring too much. Sometimes the biggest difficulty with this is time! I really feel like I’m more able to connect on weekend and evening meals (as opposed to quick rushed breakfasts and 25 minute lunches at work!) But hey, you reminded me to enjoy my oatmeal and coffee a little more this morning! I’m glad you had this reminder! And I totally agree, it’s not realistic every meal but even just doing it once a day is great practice. This is such a beautiful post, Emily! This idea specifically has been something that I personally have struggled with how to discern, as in when I find myself wanting to eat something nutritious, knowing where that is coming from. It has taken a lot of time, but has been so amazing to be finally at a place where when I want to eat something that society (and science) has deemed nutritious, it is no longer because of these external factors. It is difficult to describe, as you said, but realizing that your food choices are truly coming from an intuitive perspective is absolutely amazing. Thank you so much for sharing! I am so happy you found it helpful, Alyssa! And I definitely get what you’re saying – I’m so glad you’ve found it! Wonderful read. Thanks for sharing. It’s very hard to get there if there are external triggers. So many people are obsessed with what they eat and feel compelled to speak incessantly about it over mealtime. I appreciate your advice on focusing on what I am eating instead of others. This is important and practical advice. Thank you. It’s so very true! It’s very difficult to make peace with food in a culture that encourages overthinking, overanalyzing and disordered eating. I am glad you found it helpful! Thanks for sharing your thoughts, it’s much appreciated. I am surprised at how much better I am now with matching my food choices with my internal cues rather than focusing so much on external (i.e. what I "should" or "shouldn’t" eat). Sometimes I find myself having eggs for dinner or ramen for lunch because that is literally what sounds good and what I think will be both satisfying and nutritious in that moment. It has truly been such an inspirational experience because I had never really thought about food like that before Intuitive Eating. I was so used to eating based on what the latest nutrition facts/info was and what the media/society/fitness industry would say that I SHOULD eat. Eating now is so much less stressful now! YES! I think you describe it perfectly – less stressful, inspirational, internally motivated…it’s so freeing and enjoyable. Love it! Thanks for sharing. Well said Emily! I love the quote, "Every meal is an opportunity to learn more about yourself." Thank you Emily! I have found your blog and podcast appearances so helpful. Thank you for being willing to put this information out there. I was so desperate to find a better way with food and I am so grateful there are people like you out there willing to give of your time and talents to get this message to anyone willing to hear. I thought I would spend everyday for the rest of my life obsessed with food…and I am so relieved I don’t have to be. Thank you for all you do!